The country's most famous automatic, the AK47, still tops with terrorists. Nearly 70 years after its invention, Kalashnikov's assault rifle remains a market leader, commanding a 20 percent share of the world's small arms market, having probably killed more people than any other weapon ever conceived, the Telegraph reports. Mikhail Kalashnikov’s brilliant invention, the AK-47, designed for the Soviet Army in 1947, has in the years since become an emblem of resistance and revolution across the world. It is depicted on the national flag of Mozambique and the banners of Hezbollah and the Iranian Revolutionary Guard; adorned with flowers and jewels in a London art gallery and featured in numerous films. The AK-47 is more than a gun; it’s a symbol. The Kalashnikov - estimated to number around 75 million in current use - is the weapon of choice for guerrillas, terrorists, dictatorial regimes and rebels the world over from Mexico’s narcotics mafia to the murderous thugs of the so-called Islamic State and beyond. For many of its users it will be the only Russian-made object they will ever hold in their hands. Traditionally viewed as one of Russia’s most famous exports, the AK-47 has been produced in many countries such as Poland, Romania and Bulgaria. This year as part of a measure designed to avoid international sanctions, the first US-made Kalashnikovs have appeared on the market. Produced under the banner “Russian Heritage — American Innovation,” the new weapon is technically called a US132SS but is based on the classic Soviet design. 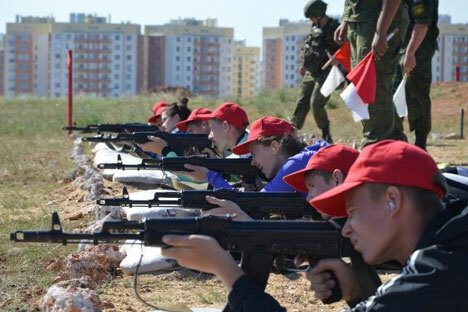 Kalashnikovs continue to be enjoy just as much popularity at home, so much so that even kids know how to operate the lethal weapon: Rossiyskaya Gazeta reports that a seventh-grade girl won a patriotic military contest organized by the Ministry of Education and Ministry of Defense. The contest involved 440 kids from across Russia competing in shooting contests, throwing hand grenades, crossing a destroyed bridge, and helping the 'wounded' in a simulated battlefield. One talented participant, Elizaveta managed to disassemble a gun in six seconds, much quicker than the normal 15 seconds that will get you an A grade. While Russian kids are enjoying themselves playing war and peace games, the playgrounds on the streets end up attracting a new – and rather older – audience. The Telegraph publishes a hilarious video of two Russian men as they discover a terrifying playground in the provincial town of Sloboda near Tver. It is, one man in the video says, a scene reminiscent of American horror movie "Saw". He goes around the playground testing various constructions that all prompt images of a medieval torture chamber: a swinging chair topped off by a metal cage, a circular contraption and a swaying wheel. Although it may seem to be a perfect location for a horror film, the playground was in fact designed and built using scrap metal from agricultural machines by Yuri Chistyakov, who simply wanted to create something for local children to enjoy. Describing the playground as creepy, the Telegraph says it was clearly not designed with safety in mind. Well, perhaps the publication has nothing to worry about: in a country where schoolgirls can take an AK47 apart in six seconds flat, a vaguely unsafe playground hardly counts as a serious problem. Children and adults in Russia increasingly seem to be trading places, with some of them even setting out for world records. In Yekaterinburg, for example, a local showman established a new world record for the longest Ferris wheel ride last week: he entered the cabin late afternoon on Friday and didn’t leave until 52.5 hours later on Sunday, not having slept the entire time, Russia’s most popular newspaper reports. It’s not all swings and roundabouts in Russia though: while some in Yekaterinburg set out for what could hardly be called the world’s most meaningful world record, other struggle on a daily basis to feed and clothe their families. Descending rapidly down to earth from the heights of the rollercoasters, we learn that over 500 families in need in the Siberian region of Kemerovo will be given an ewe and a ram each under a local food security scheme. Families with three children or more will be given the ovine animals, provided they have the facilities to look after them. Sheep were chosen for the scheme because as well as providing meat and milk, their wool can be used to make clothing, explains the BBC. The initiative also extends to single-parent families: 5,000 of which are eligible to receive five chickens and 10 kilograms of wheat to feed them with. The measure is not entirely new: since 2009, families in the Kemerovo region have been given 1,000 cows and 5,200 rabbits, in similar initiatives. The schemes are the brainchild of the region's long-serving governor Aman Tuleyev. Last week Kremlin-loyalist party, United Russia, nominated Tuleyev once again to represent it at upcoming regional elections.